Well here we are, it's almost Christmas!!! It's time to make plans and goals for the New-Year and soak up some inspiration for lots of new paintings! Meanwhile I will leave you with my latest bear commission. 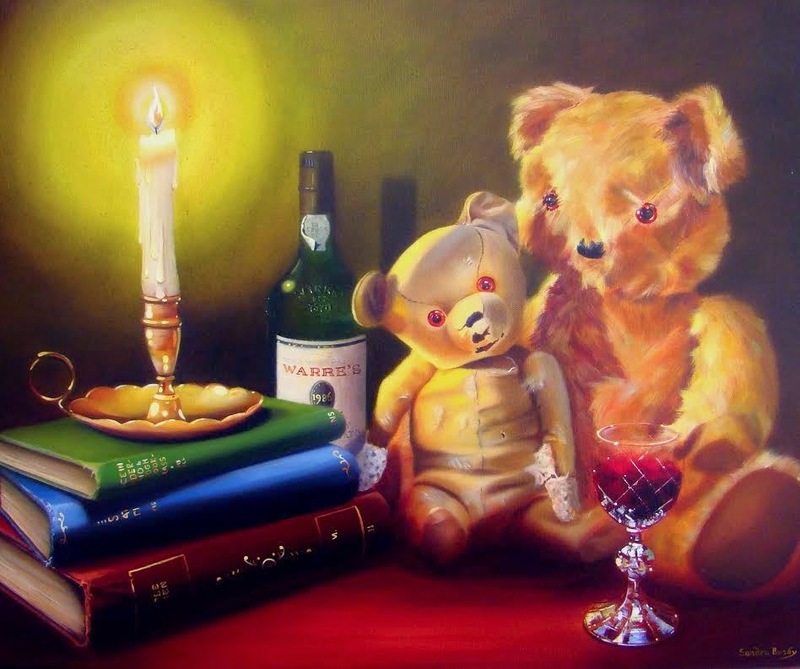 I was asked by two daughters to paint their parents two childhood bears together. Isn't that a lovely idea? So they will be unwrapping it on the big day and I just hope they are as happy with the painting as the daughters are! So I'll now be taking my annual Christmas bloggy break and will return briefly at the beginning of January before going on holiday with my husband for some much needed sunshine until February! Until the New-Year, I wish you all a wonderful Christmas and a healthy, happy and creative 2015! Cette peinture est une vraie merveille, félicitations ! Joyeux Noël et bonne année, chère Sandra. What a warm painting, full of love!!! I know the parents will love it! Sandra, I wish you and your family a wonderful Christmas, and the very best to you in the New Year!!! So happy to see the commissioned piece, Sandra! I have been waiting for so long (:)) There is no doubt in my mind that the recipients will be over the moon when they see it on Christmas day! Its adorable, sensitive and well, just masterfully done! Merry, merry Christmas to you and yours! Thanks so much Susan. I really hope so! Looks lovely, I'm sure the new owners will be very happy on the 25th. Dear Sandra, your paintings never cease to amaze me with their beauty and originality. I wish you and your dears a Merry Christmas and Happy New Year. Hugs!! Who could not love this painting? It is perfection. Best Wishes for the New Year.